^ a b Fisher, Sharon (2006). Political change in post-Communist Slovakia and Croatia: from nationalist to Europeanist. Palgrave Macmillan. p. 27. ISBN 1403972869. ^ Jones, Howard (1997). A new kind of war: America's global strategy and the Truman Doctrine in Greece. Oxford University Press. p. 67. ISBN 0195113853. ^ Hupchick, Dennis P. (2004). The Balkans: from Constantinople to communism. Palgrave Macmillan. p. 374. ISBN 1403964173. ^ Rosser, John Barkley; Marina V. Rosser (2004). Comparative economics in a transforming world economy. MIT Press. p. 397. ISBN 0262182343. ^ Chant, Christopher (1986). The encyclopedia of codenames of World War II. Routledge. p. 109. ISBN 0710207182. ^ Curtis, Glenn E. (1992). Yugoslavia: A Country Study. Library of Congress. p. 39. ISBN 0844407356. ^ Trifunovska, Snežana (1994). Yugoslavia Through Documents:From Its Creation to Its Dissolution. Martinus Nijhoff Publishers. p. 209. ISBN 0792326709. ^ Rusinow, Dennison I. (1978). The Yugoslav experiment 1948-1974. University of California Press. p. 2. ISBN 0520037308. ^ a b Perica, Vjekoslav (2004). Balkan Idols: Religion and Nationalism in Yugoslav States. Oxford University Press. p. 96. ISBN 0195174291. ^ a b c d e Cohen 1996, p. 95. ^ Century of genocide: critical essays and eyewitness accounts, Samuel Totten, William S. Parsons, 430. ^ Between past and future: civil-military relations in the post-communist Balkans,Biljana Vankovska, Håkan Wiberg, 197. ^ Judah 2000, p. 127-128. ^ a b Hoare 2006, p. 10. ^ a b Strugar, Vlado (1969). Jugoslavija 1941-1945. Vojnoizdavački zavod. ^ Goldstein. Serbs and Croats in the national liberation war in Croatia. , p. 266-267. ^ Jelic, Ivan (1978). Croatia in War and Revolution 1941-1945. Zagreb: Školska knjiga. ^ Stewart, James (2006). Linda McQueen. ed. Slovenia. New Holland Publishers. p. 15. ISBN 9781860113369. http://books.google.si/books?id=qwBUkHaz76QC&dq=James+Stewart.+%22Slovenia%22. ^ Leary, William Matthew (1995). Fueling the Fires of Resistance: Army Air Forces Special Operations in the Balkans during World War II. Government Printing Office. p. 34. ISBN 0-16-061364-7. ^ MacDonald, David B. (2002). Balkan Holocausts? : Serbian and Croatian Victim Centred Propaganda and the War in Yugoslavia. Manchester University Press. ISBN 0719064678. Banac, Ivo (1996). “Bosnian Muslims: From Religious Community to Socialist Nationhood and Post-Communist Statehood 1918-1992”. In Pinson, Mark. The Muslims of Bosnia-Herzegovina: Their Historic Development from the Middle Ages to the Dissolution of Yugoslavia. Harvard University Press. ISBN 0932885128. http://books.google.com/books?id=Yl3TAkJmztYC. Haskin, Jeanne M. (2006). Bosnia And Beyond: The "Quiet" Revolution That Wouldn't Go Quietly. Algora Publishing. ISBN 0875864295. Hirsch, Herbert (2002). Anti-Genocide: Building an American Movement to Prevent Genocide. Greenwood Publishing Group. ISBN 0275976769. Hoare, Marko Attila (2006). 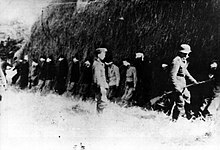 Genocide and Resistance in Hitler's Bosnia: The Partisans and the Chetniks. Oxford University Press. ISBN 0197263801. Judah, Tim (2000). The Serbs: History, Myth and the Destruction of Yugoslavia. Yale University Press. ISBN 0300085079. Milazzo, Matteo J. (1975). The Chetnik Movement & the Yugoslav Resistance. Johns Hopkins University Press. ISBN 0801815894. Mulaj, Klejda (2008). Politics of Ethnic Cleansing: Nation-State Building and Provision of In/Security in Twentieth-Century Balkans. Lexington Books. http://books.google.com/books?id=C21t6bdyv3cC. Ramet, Sabrina P. (2006). The Three Yugoslavias: State-Building and Legitimation, 1918-2004. Indiana University Press. ISBN 0271016299. Roberts, Walter R. (1973). Tito, Mihailović and the Allies 1941-1945. Rutgers University Press. http://books.google.com/books?id=43CbLU8FgFsC&printsec=frontcover. Tomasevich, Jozo (1975). War and Revolution in Yugoslavia, 1941-1945: The Chetniks. 1. San Francisco: Stanford University Press. ISBN 0804708576. http://books.google.com/books?id=yoCaAAAAIAAJ&printsec=frontcover. Tomasevich, Jozo (2001). War and Revolution in Yugoslavia, 1941-1945: Occupation and Collaboration. 2. San Francisco: Stanford University Press. ISBN 0804736154. Velikonja, Mitja (2003). Religious separation and political intolerance in Bosnia-Herzegovina. College Station: Texas A&M University Press. ISBN 9781585442263. Bokovoy, Melissa (1998). Peasants and Communists: Politics and Ideology in the Yugoslav Countryside. University of Pittsburgh Press. ISBN 0822940612. Irvine, Jill (1992). The Croat Question: Partisan Politics in the Formation of the Yugoslav Socialist State. Westview Press. ISBN 0813385423. Roberts, Walter R. (1987). Tito, Mihailovic and the Allies, 1941-1945. Duke University Press. ISBN 0822307731. ロナルド・H・ベイリー (1979). ライフ第二次世界大戦史 パルチザンの戦い. タイムライフブックス.